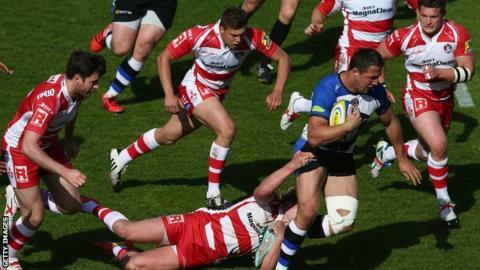 Bath scored seven tries as they crushed Gloucester to set up a home play-off semi-final with Leicester Tigers. A depleted Cherry and Whites managed a four-try bonus point before they face their own play-off against Connacht for a European Champions Cup spot. Steve McColl crossed twice for the visitors, who led early on. But converted tries from Kyle Eastmond, George Ford and Sam Burgess put Bath in control at the break and they eased to victory in a pulsating second half. Gloucester were well beaten by the end of a breathless West Country derby, but had a team showing 12 changes for a match that was of little importance for the final Premiership standings. The tone was set inside three minutes when a neat move ended with Ludlow scoring a simple try. But Eastmond skipped through to get Bath on the scoreboard, and Ford's opportunist try was followed by a third home score by Burgess, who touched down after bursting through a Henry Purdy tackle. McColl did go over in the corner for a second away try after a defence-splitting run by Purdy. But with Bath on top in the pack and providing continuous good-quality possession, they were able to build on a 21-13 half-time lead. Captain Nick Wood's sin-binning was proof of Gloucester troubles at the scrum and Bath made the most of having an extra man. Ollie Devoto crossed for a fourth touchdown and, although an error by Eastmond gifted McColl his second five-point haul, Anthony Watson crossed in the corner for the hosts to extend their lead to 36-23. But the home side had the final say, Horacio Agulla crossing the whitewash to help take Bath to 50 points. "I know we conceded 30 and there was a bit of an end-of-season, nothing-at-stake feel to the game. But looking at the 22 matches, it's been a great season. "Last year we were one point off getting fourth place. This year we're one point off top." "Everyone's fit. That includes Stuart Hooper - we could have played him - and Jonathan Joseph. Nobody's got any injuries. "Matt Banahan came off as a precaution and the others came off just for a rest really. It's a fantastic position to be in, playing Leicester at home with a fully fit squad. We can't wait. "The positives definitely outweighed the negatives. We conceded 50 points but at the same time our younger players will benefit from the experience of playing here at such an intimidating venue. "That gives us a lot of hope - not just looking ahead to the next few weeks and months, but beyond that. "Playing Connacht will be a huge challenge. We're under no illusions as to the challenge that lies ahead. It's one we are looking forward to and it gives us a chance to get the club back into Europe next season." Bath: Watson, Rokoduguni, Devoto, Eastmond, Banahan, Ford, Stringer, James, Webber, Wilson, Attwood, Day, Burgess, Louw, Houston. Replacements: Agulla for Banahan (41), Homer for Ford (57), Cook for Stringer (64), Auterac for James (49), Batty for Webber (47), Thomas for Wilson (49), Garvey for Attwood (49), Fearns for Louw (47). Gloucester: Cook, Reynolds, Purdy, Macken, McColl, A. Thomas, Braley, Wood, Lutui, Knight, Hicks, Hudson, Stooke, D. Thomas, Ludlow. Replacements: L. Evans for Cook (60), Atkinson for Purdy (65), Robson for Braley (57), Gibbons for Wood (65), Dawidiuk for Lutui (50), Y. Thomas for Knight (50), Underhill for Hudson (71), Rowan for Ludlow (64).